As many of you will know, the live webchat on Facebook as part of Richard and Judy’s Summer Reads was marred by technical glitches. However, readers posted questions to the Facebook and these were forwarded to Victoria. 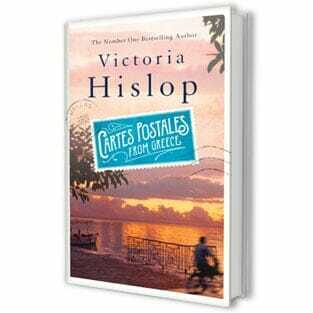 As promised, Victoria Hislop has answered your questions. Read about The Thread, her writing, her experience of being a member of a book club, her love for Greece, and more. Thank you for your questions, and a huge thank you to Victoria for her answers. Question 1: This is the second time that Richard and Judy have chosen one of your books for their Book Club. Can you describe how it felt to have been selected for a second time and how it differed from the first time? Victoria: I was thrilled – it’s a fantastic list too and I am very lucky to be included among such titles. I shall be taking them all on my own holiday (apart from my own – I’ll definitely leave that one at home!). Question 2: Did the book have an alternative title or was it always called The Thread? Victoria: The title evolved – many of the women in the novel earn their living through “thread” of some kind – either as seamstresses or rug weavers – and it is the means by which they physically survive so it has huge importance for them. But at another level, as I was writing the novel, I saw how a single thread links all the events and chapters of modern Greek history – that one thing led to another as you might say – right up until the present day. We are all connected with our past. Question 3: Clearly, you have a deep love and affection for Greece. Where has this come from? Victoria: It began when I landed in Athens in 1976 and felt this amazing wall of warmth! I loved the heat and the dust, and my passion for the country (mainland and islands) has grown with the years. Now that I have so many friends there, a house, and speak the language, I feel very much at home there. Question 4: I had little idea of the trouble in twentieth century Greece that you explored in The Thread. How did you go about researching the events in the book? Victoria: Lots of reading, visiting museums, photo archives – but most of all wandering about in Thessaloniki and imagining what it would have been like to live there during such a turbulent period of history. Question 5: Why the return to Greece in The Thread? Victoria: Once I had read and learned about the huge exchange of populations between Greece and Turkey in 1923, I realised that I wanted to follow the “story” and find out what the repercussions were for Greece (where it added 25% to Greece’s overall population). It was a massive event in their history, with over a million refugees arriving within a few months without homes, money, families. That was the initial reason for writing another novel set there. Question 6: Did the history of Greece call you to find and write the story of The Thread? Victoria: Yes, that’s a good way of putting it. I am learning new things about Greece all the time – and sometimes come across something so unexpected that I feel driven to write about it. Question 7: I would love to know what inspires you to write so lovingly about Greece. As a Greek Cypriot, I know your books have touched many Greeks both in Cyprus, Greece and the UK. Do you have a connection to Greece? Victoria: I have no “roots” in Greece – but I have a very emotional connection to the country. There is a strong sense when I get there of “coming home” – it’s a really strange feeling but a nice one too, but there is no rational explanation for it. I’m not the first British person to love Greece so much – there have been plenty of Philhellenes before me! What’s not to love? Greece is an incredibly beautiful country – the images of riot police and demonstrators has tarnished its image in the recent past – but its beauty is still there. Question 8: With all the current troubles, do you think Greece is a good place to go on holiday at the moment? Victoria: Yes, definitely. The “problems” do not really affect tourists – for anyone who cares for Greece, the kindest thing they can do is go there for a holiday. They will find taverna and hotel owners will welcome them with open arms. The blue sky, clear sea, wonderful food, landscapes, culture – are unchanged. Parts of Athens are down-at-heel, lots of graffiti and so on, but the islands are another world. Question 9: I’ve read your other two books but not yet finished this one. I noticed that they all have a combination of past and present – how do you work on them structurally – do you write the threads separately? Victoria: No, the past and present are very much linked together. The present day character is someone, almost like myself, who is listening to a story from the past. So I write my books in the order in which they are then read – first we meet the contemporary person and then we are led back to their family history. Question 10:How do you get your ideas for your books? What inspires you? Victoria: Ideas and inspiration come as a surprise – I am not actually looking for them. And once an idea grabs me I get rather obsessed with it. Mediterranean countries definitely inspire me – Greece and Spain for example are full of drama, so they are, for me, good starting places. Question 11: Are you working on anything at the moment and, if so, what? Victoria: I am just finishing a collection of short stories. I find them very exciting and interesting to write – lots of them are set in Greece (again) and some in England. They’re fun to write too. I hope readers will like them. Question 12: Have there been any discussions about turning any of your novels into films / TV adaptations? Victoria: The Island was turned into a 26 part tv serial for Greek television. It was sensational – and three out of four people in Greece watched it! I was closely involved, from casting, script editing, sewing costumes to acting as an extra. So far, no definite approaches for The Thread, but I would love to see that being adapted for tv as well. Question 13: When did you first want to begin writing fiction as a career? Victoria: From the age of 15 when I did my o’level in English Language until 2001 (I think that was 25 years roughly), I did not write one creative sentence! I worked as a journalist for several years, but as soon as I went to Spinalonga (the island of my first novel’s title), I knew that I had to write something that came from my imagination rather than my intellect – hence moving into fiction. Question 14: How often and where do you like to write? Victoria: I write most days. It feels very comfortable to be writing. I move about – that’s the beauty of a lap top, you can take it anywhere – I haven’t had a big computer for years. Sometimes I write in a library, sometimes at home, lots when I am travelling/researching. Question 15: Your books are excellent book club choices. Have you ever been part of a book club yourself, and which books would you recommend for book clubs to read and enjoy? Victoria: Thanks! Yes, I was part of a thriving book club in Wandsworth when we lived in London and also in Kent when we moved there. I read so many books that I would otherwise never have discovered – it’s great to read something that is not necessarily your own choice, but it stretches you and often surprises too. There are so many possible recommendations – I remember when we read “The Hours” by Michael Cunningham, it provoked hours of discussion. As did “The English” by Jeremy Paxman – tremendous – particularly if you have book club members from other countries. Question 16: If you were going on holiday, what would be your perfect read? Victoria: I always look for books that fit the landscape where I am going to be. I couldn’t read Dickens or Jane Austen in a hot place – I think books could have “visas” – and Dickens and Austen would feel so out of place themselves in Greece for example. Louis de Bernieres and Kazantzakis are good for me, when I am in Greece (where I will be going on holiday this year! ).